Two sons with famous family names were responsible for this monumental typewriter that originally appeared on the market in 1896 as the Remington-Sholes. Indeed, the inventor was Zalman Sholes, son of Christopher Latham Sholes, and the manager was Franklin Remington, son of Remington & Sons, who built the first Sholes & Glidden typewriters. The machine was a true Victorian design with neo-classisist columns and relief decorations and a stunning bronze coating that made it look like a Greek temple. That design was by architect Charles Atwood. At first glance the machine seems closely related to the Remington typewriter, but it had a number of remarkable improvements. One of these was that the shift system operated the actual typebasket and not the carriage (as on the Remington), making the operation of the machine much lighter. The Remington Typewriter Company however, was not amused with the business spirit of the sons with the famous names. The company sued and in 1901 Sholes and Remington were forced to change the name of their company to Fay-Sholes (Charles Fay was the company's president). three details of the Fay-Sholes: character indicator, ribbon and escapement . The machine was now marketed as the Fay-Sholes (as seen here), and later still as the Fay-Sho. Also, models called Rem-Sho are known. Several new models were built, up to the a No 10, but commercially the machine was not a success. 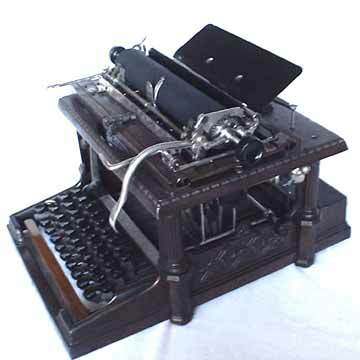 By 1909 what was left of the company was sold to the French typewriter producer Japy that later introduced frontstrike typewriters under its own name. For more details on the machine and the lawsuit, see the book â€œTypewriterâ€�, page 126.